1e Tunnels & Trolls, Part 12: Where Did All the Magic Items Go? 22. Where Did All the Magic Items Go? 1st edition Tunnels & Trolls has no magic items list. Indeed, there is no section, paragraph or sentence in the entire document specifically devoted to discussing or explaining magic items. However, it is clear from a close reading of the original text, that a Tunnels & Trolls fantasy world is expected to be one where magic items exist, if not in abundance, then at least with some semi-regularity. Magic items are mentioned. But there is no explicit guidance presented anywhere in the rules as to, say, what a "magic item" actually is or what sorts of properties such a thing might have. Under most circumstances warriors may not cast magic spells, although they can use enchanted objects to their benefit [p. 7]. It was Greg Brown who first suggested that [wandering monsters] might carry treasure on them, and made a chart to determine the fact. Roll 1 die. If you get a 1 or a 2, the monster has treasure. If it has treasure roll 1 die again. A 1 or 2 yields copper; a 3 yields silver; a four yields gold; a 5 yields jewels; a 6 yields a magical item. 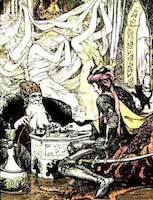 It is up to the D.M to quickly determine how many coins, jewels, or what kind of magic the creature has [p. 10]. Magical items found or acquired in the dungeon will also be worth e.p. [experience points] to the characters that acquire them if they can bring said item safely to the surface. The D.M. will determine the value of such objects individually. 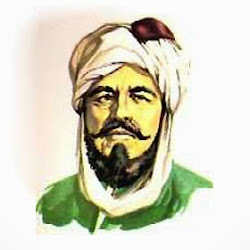 (Try to make them worthwhile, D.M.s or everyone will steer clear of all your magic) [p. 14]. Near the entrance to very tunnel complex are great super-markets for dungeon-delvers. In these general stores, the arrant adventurer with enough cash can buy practically anything he wants to take down with him, although such stores are usually quite short of magical items with the exception of staffs for magic-users [p. 17]. The world of 1st edition Tunnels & Trolls does not appear to be a "low magic" world. Two out of the three player classes may cast spells, and there is a powerful and ever present Wizards Guild (or perhaps a set of them) that trains new magic-users, attempts to regulate the use of magic and does a brisk business in selling magic staffs and spells. Also, according to the rules, more than 5% of all wandering monsters carry magic items around with them (which is arguably much more than you ever got from wandering monsters in OD&D). So, one assumes that the intention, if there was an intention, behind not talking about magical items was not to de-emphasize them. Instead, one might initially postulate that the idea was to leave out an explicit list on the grounds that it would be a constraint on imagination. Fair enough. But in honesty, there's nothing in the text to spark the reader's imagination (on magic items), either. This is in contrast to the treatment of monsters in 1st edition T&T. Recall that fabulous monster paragraph I referenced in a previous review, where 77 diverse and fantastic entities are named - from "fire-breathing dragons" to "jub jub birds" to "drooling maniacs" to "mantichores, and lots more." Contrast the absence of magic items in 1st edition Tunnels & Trolls with their prominent place in Dungeons & Dragons, where a fairly long and detailed list of magic items - everything from talking swords to cursed scrolls to enchanted elven boots - was one of the central features of the game from the very beginning. This list would expand as the number of supplements and the length of editions expanded. For OD&D, in addition, the importance of magic items was arguably built into its class and experience mechanic. For example, the power of a high-level fighting-man would usually be partly based on the fact that he was almost expected to possess and wield, say, a +3 sword and wear +4 plate armor. In turn, the value and survivability of a low-level magic-user was enhanced by his unique ability to use scrolls. And so on. Was the assumed presence of magic items also built in to the rules of 1st edition Tunnels & Trolls - perhaps as an expected feature or enhancement to level progression, for example? It isn't clear. The rules do not say, nor even hint, at least in that original edition. Now, at first I assumed the relative silence on magic items was simply an oversight of the quasi-draft form 1st edition, and that it would be "rectified" in later editions. Not so. 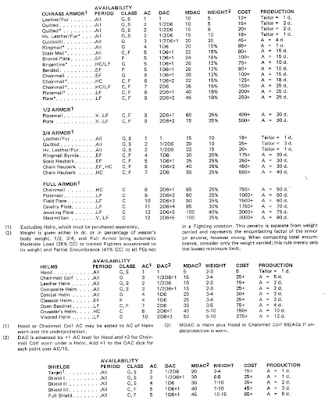 The 4th edition (1977) adds 12 pages of supplementary material, including an "Easy Jewel and Treasure Generator," a "Jewel Generation Table," an explanation by Rufus the Morose on "the effects of having charisma," an "Optional Size and Weight Chart for Men and Monsters," a sort of imported bit from the spinoff game, Monsters! Monsters! (1976) on "Experience Points for Monsters," recommendations on how to assign monster ratings to monsters on different levels of the dungeon, expanded and alternative rules for bows and marksmanship, rules for using two weapons in combat, a lengthier explanation of "The Logic of Magic," an expanded section on poisons, and even a poem (! ), but nothing more on magic items. ...Doubles, on the other hand, indicate that the treasure is some kind of magical object. (I have my own list of magical objects that can be found, but it would probably be better if every DM made up his own list of magical items to be found) [4th edition, p. 6]. So that helps a bit, especially for readers such as myself who often get fixated on "why" sorts of questions. But it still might be asked, especially by a reader new to this sort of thing, what is a "magical object," and what guidance is there for a D.M. to make up his own list? Now, I don't think a "just use your imagination" sort of retort is sufficient here. It is only because of the example set by Dungeon's & Dragons that we have perhaps come to assume that there is this obvious and almost infinite cornucopia of magical objects that anyone even remotely interested in fantasy would, so to speak, have floating around in his imagination. I'm not sure this is true even now, but it certainly wouldn't have been true in 1975. It just wasn't really in the fantasy or science fiction culture, even for the most well-read fans. To take just a few examples: Robert E. Howard's Conan stories go easy on magic. Jack Vance has the occasional bizarre contrivance that's more often annoying than anything else. There are some obvious magic items in Narnia and Middle-Earth but not as many as one first might assume. And so on. MAGIC: Characters should have listed here any magical implements they manage to pick up, and what they do. At the start, Fang has none [Creating Characters, 1.3.3]. Also. GMs often let you run across magical treasure which improve (or worsen) your luck, so ratings of 30 or even higher are not unheard of [Saving Rolls, 1.8.1]. Once upon a time experience points were given for treasure and magical items found and carried off, but no longer!...a magical iron ring that bestows on its wearer an additional 10 Luck points is also its own reward, and should not give 'adventure' points as well [Adventure Points, 1.9.2]. Warriors ... recognize the value of magic and magical artifacts and while there may be an undercurrent of mistrust of magicians, warriors will cheerfully utilize any magical artifact that comes to hand [Character Types, 2.11]. [R]oll one die - ...6 = gems or magical item ... Do be very careful with magical items (or delete them entirely) because an orc with an ounce of sense will make use of a really good item against the party - he wouldn't leave a 10-die sword flopping at his bely while he attacked the party with claw and fanfics. Either don't give such items away (from Wandering Monsters, at least) or give the party a taste of a special item before they lay hands on it [Wandering Monsters, 2.42]. It is a good idea [when stocking the dungeon] to put in...more gold than jewels or magical objects [How to be a GM, 2.5.1]. Every other jewel created will have a single magic gift which can be used but once; after it is gone, the jewel is non-magical but still of full value. The magic gift adds to a Prime Attribute. Roll 1 die: 1=ST, 2=IQ, 3=LK, 4=CON, 5=DEX, 6=CHR. Roll 1 die again and add that amount to the attribute indicated [Trollstone Caverns - a sample mini-adventure, 2.7.2]. Once again, there is no general passage or section where it is clearly explained what sort of thing a "magical implement," "magical treasure," "magical item," "magical artifact," "magical object," "magical gift" or whatever else it might be called might be. The attentive reader would perhaps assume, based on the passages, above, that the only major purpose of such items was to raise attribute scores (although, once in a while one might find a really powerful sword or an enchanted wind instrument). One might even say that opportunities to hint at the wondrousness of magic were basically blown. After all, adding to one's prime attribute scores is almost mundane in T&T, in the sense that it's already built in to the experience mechanic. A warrior advancing from 4th to 5th level could increase his Luck score by 10 on his own. Of course, that's not to say that a player-character wouldn't love to have a device that would do it "for free." But in terms of setting a fantastic tone for the world, it's not anywhere near as evocative as, say, a black sphere of annihilation, or cursed boots that make you dance or even a ring of invisibility (all, obviously, examples from OD&D). Given that early Tunnels & Trolls is quite evocative in all sorts of other ways, I find its thin and, arguably, boring treatment of magic items to be extremely odd. Zappathingum (7th level spell - cost: 24 strength points): "Enchants any weapon permanently to triple its ordinary effectiveness." Zapparmor (8th level spell - cost: 30 strength points): "Enchants armor to triple its current protection value. Armor also mends itself between fights so it is always full strength unless completely destroyed in one fight." I assume that Zapparmor is implicitly permanent, even as Zappathingum is explicitly so. These two spells seem insanely overpowered to me. Not only do they triple the value of the item, but they do so (or in the case of Zapparmor, seem to do so) permanently. And of course, there's no reason why, after resting up and regaining your strength each time, you couldn't use them to pump up the armaments of every member of your party. Who needs to find a magic sword or magic armor when a mid-level magic-user could easily create sets of them - and with a power (triple strength!) that would sent any OD&D warrior into a berserker frenzy of jealousy. Interestingly, in 5th edition, these spells are scaled way back such that they only last 1-6 hours. 7E: You have found a magic sword. It is worth 1000 g.p., it doubles your strength while you are carrying it, it takes 20 hits for you every combat turn, and it wards off all evil magic up to 20th level! Go to 19E. Roll 1 die (1 - 6) and go to that number on the list below to see what you found. Do not misunderstand my purpose with the above. I think these items are great. 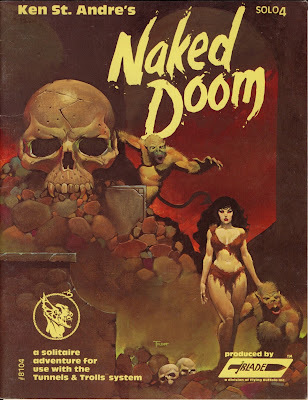 (For the first two "killer dungeons," getting one's hands on one of these hugely powerful items is probably necessary to make it out of the dungeon alive - this is explicitly confirmed by St. Andre in the introduction to Naked Doom.) But there isn't that much to help the aspiring D.M. who wants to know what to put in his "non-killer" long-term campaign. One might also ask, to the extent that The Dungeon of the Bear provides a few hints, why should someone need to buy that separate adventure in order to acquire them? Wasn't the whole point of T&T that it was a game you could just purchase (for a fraction of the price of a D&D rule set), read, understand and play? Also, do not misunderstand my purpose for the overall post. My intention is not to criticize T&T for, so to speak, gypping customers out of their natural entitlement to a magic items section, guaranteed by U.N. charter or whatever, but to point out a quirk or anomaly in the early editions of the rules that I find interesting and (to me) a bit mysterious. It's possible some of what was going on was worry over copyright infringement. Perhaps, to not include magic items or much guidance about them was another way of buying a bit of insurance if Tactical Studies Rules ever came after Flying Buffalo for too closely imitating Dungeons & Dragons. The people who manufacture game "X" have informed us that they don't want us to mention their game in our advertising ..."
Tunnels & Trolls had been noticed. So perhaps it was better not to poke the Gygax bear with a potentially derivative looking potion list. Wizards not only use tools in their spellcasting, they create magical things for their own use or to sell to others. Potions, wards, and magical items have a long and storied history in games, in novels, in comics, and in myth—all of which T&T draws upon for inspiration. Logically, every imaginable spell or magical effect could be embedded into a physical item for easy transport and convenience of use. Healing potions come in handy when a medicmage isn’t available. A ring of invisibility works pretty much like a personal Hidey Hole. A necklace that deflects all spells from the Conformation school of magic keeps the Circe-like swine-makers at bay. A gigantic fire opal carved as a shield could absorb all fire spells and fire them right back at your foes, twice as strong. So fear not, you can now read Tunnels & Trolls, confident in the fact that your U.N. sponsored human right to having a magic items section in your RPG has not been infringed upon. That's an interesting question (a few wonky historical types might think). I don't know the answer. Next: Where Did All the Equipment Go? What was the first fantasy game to incorporate ring mail, scale mail, piece armor and multiple sizes and makes of shields into its armor system? The answer is Tunnels & Trolls, three years before the Advanced Dungeons & Dragons Players Handbook. I know this schtick of mine (T&T was first in this or that, and/or was more detailed than its precursor in this or that) is getting a bit old by now, but I want to keep, so to speak, hammering it in. It might be a wonky historical thing, but I think it's interesting and notable. 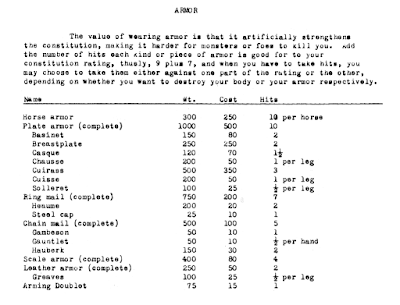 The supposedly "simple," "easy" and "stripped-down" alternative to Dungeons & Dragons had a relatively large selection of armor possibilities. T&T would remain one of the few fantasy games to do so through the 1970's, as most of the offerings in the first six years of the hobby more or less adhered to the tripartite standard of leather/chainmail/plate set by Gary Gygax and Tactical Studies Rules in 1974. Okay, caltrops aren't shields, but still. You also might notice that the R.A.F. Flight Helmet and Steel Beaney, etc. are not on the list. Those were jokes by the artist, Rob Carver. It makes sense that the games published by Tactical Studies Rules (later, TSR) would stay on this track. With an "armor class" system consisting of eight possibilities or degrees of armor coverage from AC 9 to AC 2, having only three types of armor (or four types if you counted wearing no armor as a type), plugged right in to the system. The four types would neatly become eight if each split into the particular type with or without a shield. And looking back on it, this is what made the explosion of armor types in the Advanced Dungeons & Dragons Players Handbook seem so out of place. Suddenly armor class lost its meaning as a "class." AC 7, for example, represented Leather + shield OR Padded armor + shield OR studded leather OR ring mail. The further grafting of a weapons vs. armor type chart onto the new scheme made no sense, since each class now contained up to four divergent types of coverage. And, of course, the addition of an extra notch - AC 10 - made things even more confusing. Looking more closely at early games from Tactical Studies Rules, Empire of the Petal Throne (1975) adhered to the OD&D standard, as did Metamorphosis Alpha (1976) and Gamma World (1978), though the latter two would change the armor names around a bit to reflect a more primitive or post-apocalyptic vibe - leather became "heavy fur or skins," chainmail became "cured hide or plant fiber," and so on. Curiously, the non-TSR Arduin Grimoir (1977), which added more detail and options to all sorts of things, roughly adhered to the original unholy trinity, adding only scale armor and a kite shield into the mix, and the insanely complicated non-TSR The Complete Warlock (1975, 1978) with its pages and pages of lists and charts cooked up by Caltech numbers nerds, made only a timid venture into armor expansion by adding merely the brigandine and "chain-plate." As far as I can tell, the second fantasy game to follow Tunnels & Trolls in going, so to speak, full-diversity in terms of armor was Chivalry & Sorcery (1977), followed by Runequest (1978), which put a premium on piece armor. And that's a bit ironic. Tunnels & Trolls was that "less serious" game, while Chivalry & Sorcery was about as serious (way past a fault, many would say) as you could get. And, of course, Runequest was also very much on the serious side. So who first introduced ring and scale to role-playing games? The answer can be found in the first printing of Tunnels & Trolls (1975), which includes a detailed armor chart that divides plate armor into constituent parts (the basinet, breastplate, casque, chausse, cuirass, and solleret), and does the same for chain, ring, and scale. Here Ken St. Andre proves a solitary innovator: though he reuses the ring and scale categories in his Monsters! Monsters! (1976), few soon followed his lead: even the exhaustive list in Chivalry & Sorcery (1977) skips ring and scale . . .
How much armor should a fantasy game have? There are two parts to the question - one is mechanical and the other is aesthetic/historical. 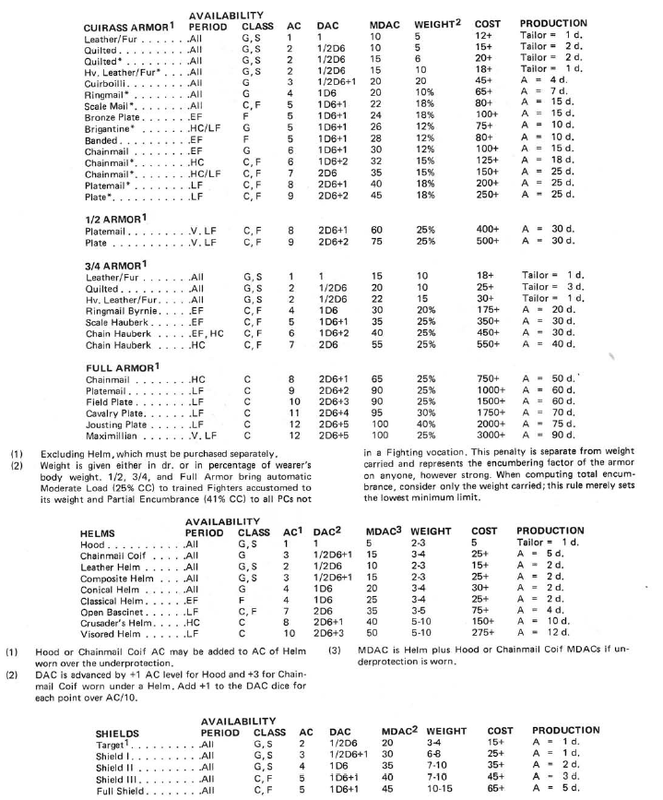 In my view, for an OD&D type eight armor class system (which of course T&T did not have), anything more than three armor types is too much, for the reasons explained above. I suppose you could have more than three different names for, say AC 5 armor - we use mail here in the northern lands, in the south they use lamellar and those weirdos in the forest use plant fibre - but if you put them all on the same equipment list it fusses things up, and the players will simply choose the cheapest or (after they have some money) least encumbering alternative. A piece armor system placed on top of the three, also fails for some of reasons explained above. I think you could have a piece armor system on its own. 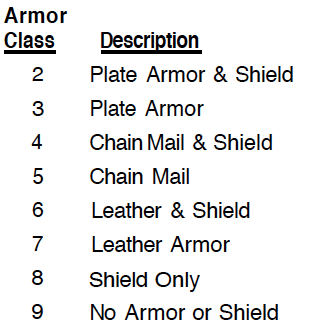 Instead of leather, chainmail and plate, for example, you could, say, simply have different levels of plate coverage. A number of games have done this to excellent effect, especially when simulating non-medieval or non-European armor systems. See, for example, the recent Swords and Wizardry White Box based Ruins and Ronin (2009). For a non-OD&D absorptive armor system, such as Tunnels & Trolls, all bets are off, and it would initially seem to grant a wider degree of freedom to incorporate greater and more diverse armor types. But I'm not sure. Piece armor almost seems out of place. The point of, say, a breast plate is not that it absorbs less damage than a full suit of plate but that it either absorbs the same amount of damage (if you strike it) or absorbs no damage at all (if you strike another part of the body). Perhaps this is a quibble. And, arguably, the Tunnels & Trolls combat system is presented at such a high level of abstraction that it's silly to even worry about the issue. More to the point for either, say, D&D or Tunnels & Trolls is why you need more than a few choices, given that players will always go for the best ones. 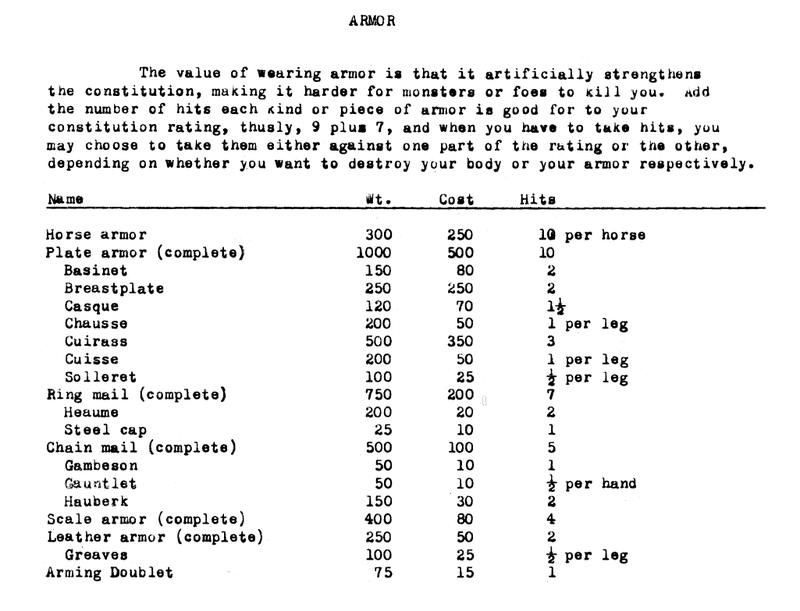 AD&D had nine different types of armor (or ten if you counted the off-the-initial-scale armor type, full plate), but fighters would pretty much always gravitate towards plate (or full plate), at least once they had a bit of money. The other armor alternatives would be left for silly NPC's to wear or to create annoying situations - Wow, a +2 suit of ring mail! Gee, thanks, I guess, Santa! You can create some interesting choices by making use of other variables such as, say, encumbrance - you might choose something a bit less protective than plate if it were much lighter - but it's still almost impossible to make nine or ten types attractive. Tunnels & Trolls somewhat bucked this problem by simply making more protective armor progressively more heavy. Given the extra importance placed on strength-based carrying capacity in T&T, this arguably worked - you might very well choose, say, chain mail over plate, just so you could use that great axe (or just so you wouldn't collapse in your armor after expending a few strength points casting a spell). I should note that 5th edition Tunnels & Trolls made chain mail (5th edition would, with more accuracy, call it simply, "mail") heavier than plate. This made more sense from the standpoint of historical realism but essentially made the existence of mail pointless. From an aesthetic or historical point of view, the military historian, Gary Gygax set a very bad precedent with his armor types. Leaving aside the odd and ahistorical terms - "chain mail" (instead of just "mail) and later in AD&D, the almost non-sensical, "plate mail" - Gygax postulated a world in which different historical armor types existed side-by-side at the armor store. But in fact, mail was medieval, while plate was not. Plate armor came into its own during the renaissance period and after. And it was an improvement in every way over mail. It was more protective and lighter and cheaper. I doubt there ever was a time when, say, knights went into battle with some of them wearing mail and some of them wearing plate, or even a time when mail wearing knights confronted plate wearing knights. Indeed, in most historical times and places, soldiers didn't really make choices as to armor types. Armor was just armor - made out of bronze, mail links, metal plates or what have you, based on the technology level and time period. You might have a bit of choice over the number of pieces you wore (or could afford to wear) but that was it. It might be objected that historical accuracy is beside the point, that these are fantasy games we're talking about, etc., etc., but for Gygax, at least, who seemed to pride himself on getting this sort of thing right, it's a bit weird. Regardless, the precedent was set. I bit the bullet and used the unholy trinity of leather/mail/plate for Seven Voyages of Zylarthen, partly because I felt that it had become too canonical to leave out of an OD&D based game. I tried to make mail more attractive by making it much less encumbering than plate (again, inaccurately from an historical point of view), and by pumping up the constraints of encumbrance such that such a consideration would matter. I have to say, though, that that "compromise" still annoys me a bit. I think the armor choices generally work for 1st edition T&T, though I still have my reservations about the piece thing. And I don't know about that tower shield. Why not just allow warriors to drag a metal sheet down into the dungeon and ask the monsters to hold up for a moment before you set it up? Next: Where Did All the Magic Items Go?